Abstract Tales of smuggling in Peldon always centre on the pond by the Peldon Rose where the story of a shaft down which casks were dropped and hidden, defying discovery by the Revenue men, has been retold many times. The story told by Jane Pullen, landlady of The Peldon Rose between 1881 and 1935 was quoted by countryman and writer, James Wentworth Day in his book Marshland Adventure. This shaft in the pond was filled up within my own memory. In the Smuggling Villages of North East Essex by George Pluckwell, the author relates this pond had a false bottom and tubs of rum, Holland gin and even rolls of silk would be hidden there. He continues that the kegs were weighted with stones and covered with soil to give the Revenue men the impression that the bottom was level when they dragged the pond for contraband. Another ruse was to use blocks of salt to weight the kegs and after a few days the kegs would rise to the surface as the salt dissolved. The truth of these stories could be disputed but what is likely is that every local pub was supplied with wines and spirits by the smugglers and people from every village along this coast were involved. Stories of smuggling can romanticise a trade that could be dangerous, often violent and the consequences if caught were great. The convicted smuggler faced prison or transportation, the cutting up of his vessel and being pressganged onto naval ships especially during the Napoleonic Wars. From the authorities' point of view, smuggling seriously endangered the financial stability of the country and in the eighteenth century it was estimated that goods in excess of £3 million in value were being smuggled annually when the legal trade of the country amounted to some £12 million. Customs and Excise duties represented the major part of the country's revenue and it was not until 1799 that Prime Minister William Pitt introduced Income Tax. For most of the eighteenth century, tea was the most smuggled item. Duties on tea at their height were 125% until Pitt reduced them to 12.5% in 1784. If we are to believe A Smuggler's Tale by Rudyard Kipling 'Brandy for the Parson, Baccy for the Clerk, Laces for a lady' people at all levels of society were implicated one way or another. Neither was it just goods that smugglers dealt in. In A Smuggler's Tale Kipling refers to 'letters for a spy'. The fact that smugglers were a source of intelligence during the French Wars is borne out by Napoleon's damning praise. Despite the serious undermining of the country's finances and security by the smuggling trade there has always been a sneaking admiration of the smuggler in his battle against the representatives of authority. Whether remembering the line we've known from childhood, 'Watch the wall my darling while the gentlemen go by' from Kipling's poem or landlady Jane Pullen's stories - she was known to quote the poem - we buy into the romanticism and are impressed by the ingenuity of the 'free traders' of the past. The following account in Mehalah, the novel written by East Mersea's vicar, the Rev Sabine Baring Gould published in 1880, gives a detailed and vivid picture of the trade in this area. At this period, the mouth of the Blackwater was a great centre of the smuggling trade the number and intricacy of the channels made it a safe harbour for those who lived on contraband traffic. It was easy for those who knew the creeks to elude the revenue boats, and every farm and tavern was ready to give cellarage to run goods and harbour to smugglers. Between Mersea and the Blackwater were several flat holms or islands, some underwater at high tides, others only just standing above it, and between these the winding waterways formed a labyrinth in which it was easy to evade pursuit and entangle the pursuers. The traffic was therefore here carried on with an audacity and openness scarce paralleled elsewhere. Although there was a coastguard station at the mouth of the estuary, on Mersea 'Hard', yet goods were run even in open day under the very eyes of the revenue men. Each public house on the island and on the mainland near a creek obtained its entire supply of wine and spirits from contraband vessels. Whether the coastguard were bought to shut their eyes or were baffled by the adroitness of the smugglers, cannot be said, but certain it was that the taverns found no difficulty in obtaining their supplies as often and as abundant as they desired. The villages of Salcott and Virley were the chief landing places, and there horses and donkeys were kept in large numbers for the conveyance of the spirits, wine, tobacco and silk to Tiptree Heath, the scene of Boadicea's great battle with the legions of Suetonius, which was the emporium of the trade. There a constant fair or auction of contraband articles went on, and thence they were distributed to Maldon, Colchester, Chelmsford, and even London. Tiptree Heath was a permanent camping ground of gipsies, and squatters ran up there rude hovels; these were all engaged in the distribution of the goods brought from the sea. In 1815 the Maldon Collector of revenue officially acknowledged that the principal smuggling centres were West Mersea and the rivers adjacent. In the 18th and 19th centuries a major part of the Government revenue came from customs duties and pursuing the smugglers was a profitable pursuit. A surprising number of goods had excise duty placed on them that resulted in these goods being smuggled. Over the centuries they have included alcohol, tobacco, salt, tea, coffee, sugar, nutmeg, pepper, silk, lace, leather, soap, ship parts and sails and during war-time anything that was rationed could be obtained. But the 'free traders' always remain shadowy characters unless they are caught by the Revenue men and their stories told through the Customs' records. By the early 19th century the authorities had cracked down on the old-style smuggling methods from the previous century, where smugglers used open beaches to deliver contraband into the hands of waiting horsemen in broad daylight. A new type of smuggling was emerging using the creeks and marshes around the Blackwater, Mersea Island, Tollesbury and Bradwell employing stealth and subterfuge. In Marshland Adventure, James Wentworth Day tells of some of the ingenious tricks used by the smugglers to avoid detection. These included false-bottomed boats, hollow masts, spars and oars which could hold hundreds of cigars, tobacco twisted into ropes then covered with rope yarn, and once a mock funeral. A ship came into the river 'from foreign'. It was announced that one of the crew had died and had wished to be buried at sea. The coffin lay ready on deck, nailed up, complete with brass plate and the man's name on it. The parson was sent for from on shore and rode out to the ship. The funeral service was read and overboard went the coffin with a splash. Several days later, when the Excisemen were busy elsewhere, up came the coffin full of contraband, and honour was satisfied. The Port of Maldon was the centre of the Preventive men for this area and together with putting Revenue Men on watch in stationary boats out in the rivers, employing Coastguards, and requiring licences for boats over 18 foot long, life was made very difficult for those involved in the smuggling trade. From the diary of a Fingringhoe Farmer, Joseph Page, it is clear the Customs Men sold off confiscated goods. It was out of this money that the Customs Officers received their rewards. 1800 April 1st Bought at the Custom House, Colchester, one lb and a half of chocolates at 3s 5d a lb, and six pairs of shoes at 1s 9d per pair, sold 4 pair for 9s. 1801 February 10th Went to Custom House, Colchester and bought 8 gallons of gin at 8s 10 and a half and 10 gallons for Mr Jo Simson. Joseph Page's diary, (extract from Essex People, A Brown). Those smugglers who operated locally were largely fishermen and oyster dredgermen. Their accomplices were usually farm labourers who knew the salt marshes intimately and could offer remote outbuildings for storage. Anecdotally, the cottage, Englesbatch, down Newpots Lane in Peldon, near the sea wall was used for storing smuggled contraband. In 1836 when a Great Wigborough man, Samuel Ellingford applied for a licence for his smack The Dolphin it was noted by the Customs that he had been previously convicted of smuggling. Rich came alongside in the Rays'n [Ray Sand Channel between the Blackwater and The Crouch] in his smack Swallow of Faversham. He transferred twenty-nine half-ankers into Patmore's well and told him to take them to the decoy in the Blackwater, where a party would be waiting. Arriving off Goldhanger, Patmore was directed where to land by John Gurton, a fisherman. With Gurton's help they rowed some of the tubs ashore at the decoy, while the rest were taken in the Swallow's boat up to Mersea Quarters, where they were met by Rich, who gave Patmore two sovereigns and told him to meet him at Wivenhoe the next Sunday for the balance of 12s 6d a tub, with 7s 6d for provisions - £12 in all. But before he was paid Patmore was detected. He refused to produce the boat's licence, saying it had been given to a man at Milton, Kent, who was about to buy her, but it was found on Bradwell beach next day in a paper parcel, so he had evidently thrown it overboard. This was apparently to protect Charles Paine, a Battlesbridge hoyman, who explained that he had taken The Friends Goodwill as security for a loan, but instead of taking a mortgage he was made owner and obliged to give a £53 bond for the licence. The Customs, noting that he was married to Patmore's daughter, took leave to doubt his innocence and insisted on their £53 which he paid. Patmore himself went back to Chelmsford gaol, where the gaoler observed he had a 'small supply of provisions brought in by his friends, but no money'. Daniel Rich seemed to have got off scot-free on this occasion and continued about his business until he fell foul of the authorities again whereupon Patmore decided to tell the full story. Meanwhile, Rich made a blunder. He was caught aboard 'a foreign vessel not being square-rigged' with 228 gallons of brandy and 162 gallons of geneva [gin], within eighteen leagues of the coast of Kent, and sent to Chelmsford by the Harwich collector. Lying in prison, with his Friend's Goodwill lost, and still owed £12, Patmore came out with the full story, content that the Swallow be seized if he could gain some remission. Since both men were in the same gaol this is one of the many occasions when one wonders how they could get on together. The Smugglers Century, Hervey Benham. As well as the imprisoning of masters, crews and sometimes owners, vessels could be seized, used by the authorities, sold, or, at worst, condemned and cut up. From 1811 onwards a record of all the craft cut up at Colchester and Brightlingsea is to be found in a surviving list of Custom House sales. In January 1835 we come across Daniel Rich again. James Cook, owner and master of The Dagger, a forty footer built at East Donyland in 1812 was spratting in the Swin. Hervey Benham relates the story. ... he was hailed by the Fanny of Whitstable and invited to meet Daniel Rich in the Spitway the following morning ... for £20 he agreed to put seventy-nine tubs under his sprats, run them into Brightlingsea and meet Rich at The Greyhound Inn, Wivenhoe, to settle up. The story emerges ... in Cook's petition from Chemsford gaol, where he was lodged along with his mate, William Bareham, at the time his smack was being cut up and sold'. Daniel is to be found again in the 1841 census in Wivenhoe where he is described as a mariner, living with his wife, Ann, his son John and two further children Mary Ann and Alfred. 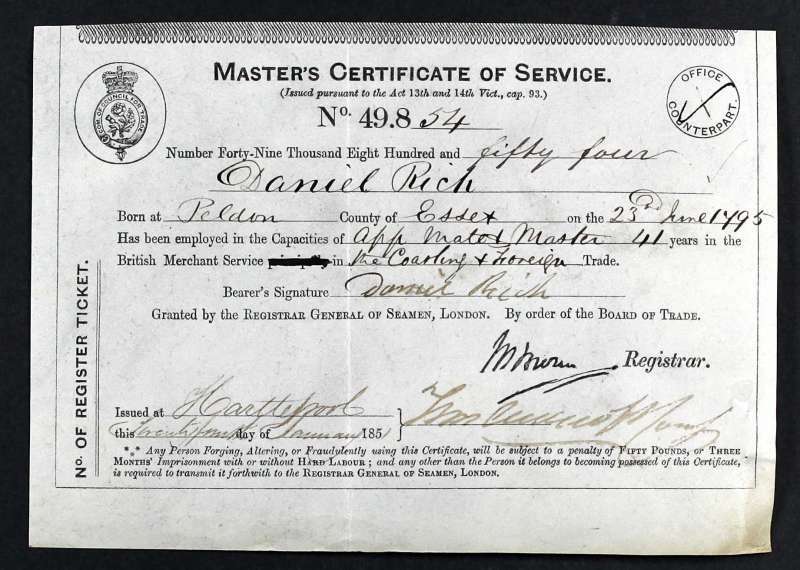 That he continues a life at sea is borne out by his Masters and Mates Certificate signed in 1851. From this document we learn he was born on 23rd June 1795 in Peldon. (Although the entry of his baptism in the register for St Mary's Church, Peldon gives his birthdate as 23rd June 1793). He began his life at sea at the age of 15 and spent 41 years in the British Merchant Service in Coasting and Foreign Trade as an Apprentice, Mate and Master. His son, John, too worked in the Coasting trade for 12 years starting at the age of 14 in the capacity of Lad, Mate and Master. 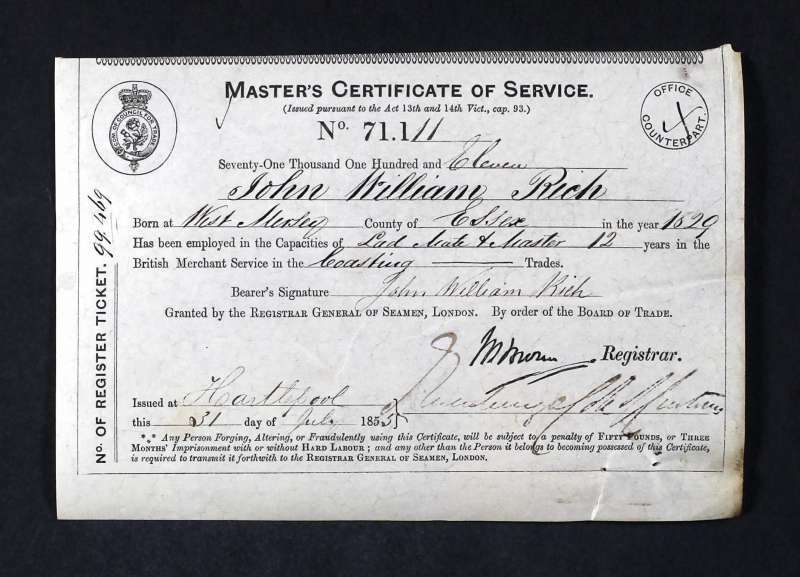 We find John many years later, in Yorkshire, unmarried and lodging with a master mariner and his family. According to the Peldon parish register Daniel was born on 23rd June 1793 the son of Daniel and Elizabeth Rich nee Whighten. They already had a son, James, born May 1791 and baptised in December of the same year. Their daughter, Sarah, born in March 1790 and christened in June 1790 appears to have been born out of wedlock. Their marriage at Peldon Church is given as March 1791 and they both use their mark on the register. Upon Daniel's capture it is recorded that he could read and write - it is interesting to note that the National School in Peldon was built in 1833 so this would indicate there was schooling here much earlier, at the turn of the century. By 1850, with the steady reduction or removal of duty on many goods, smuggling began to decline, the only goods that brought in appreciable revenue being tobacco and spirits. That year, because of the increasing number of travellers involved in petty smuggling it was decided to allow all passengers half a pound of tobacco or cigars without duty as long as it was for personal use and in 1875 a pint of spirits was also allowed, thus 'duty-free' allowances began. The black market will always be with us. After World War 1 into the 1920s there was an increase in tobacco smuggling,and with a shortage of sugar, saccharin was also smuggled in. After World War 2 anything in short supply was obtained including tinned food, butter, jewellery, watches, cameras, cosmetics and nylon stockings, along with the usual tobacco and spirits. In the twenty-first century, tobacco and alcohol (some counterfeit brands) are still smuggled in along with drugs such as heroin, cocaine and ecstasy and arms. Most entry points are the main ports such as Felixstowe and Harwich and our airports, Stansted and Southend. The battle between Customs Officers and smugglers continues. Title: Master's Certificate of Service. Daniel Rich. Born at Peldon 23 June 1795. Has been employed in the Capacities of App Mate & Master 41 years in the British Merchant Service in the Coasting & Foreign Trade. Title: Master's Certificate of Service. John William Rich. Born at West Mersey in 1829. 23 June 1795. Has been employed in the Capacities of Lad, Mate & Master 12 years in the British Merchant Service in the Coasting & Foreign Trade. Title: Englesbatch, Newpots Lane, Peldon. It is near the sea wall and it is said that it was once used for storing smuggled contraband. The cottage was once known as "Rose Cottage" - not the only one in Peldon.